Eastbourne Cricket chairman Ian Fletcher-Price anticipates a 5,000 capacity crowd at the Saffrons as Sussex Sharks return to face Essex Eagles on Sunday, June 3. It’s only the second time Eastbourne have hosted Sussex since 2000, having welcomed Gloucestershire last May. Jason Gillespie’s Sussex look set to arrive for their 50-over Royal London One Day Cup match in high spirits as they appear to have found their form in the one-day format following their 75 run win against Somerset on Tuesday. Luke Wright was back to his best as he whacked 105 from 87 balls. They are second in the One Day Cup table after three matches, with upcoming fixtures against Middlesex, Gloucestershire, Surrey and Glamorgan before the Saffrons showdown. “It’s an exciting time for Sussex and we are delighted to welcome them back once again,” said Fletcher-Price. 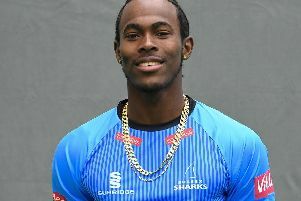 “With Dizzy (coach Jason Gillespie) leading the way and players like Jofra Archer and Luke Wright getting back to his best, it promises to be quite an occasion. Last year proved a real success and the town fully supported the event and the appetite is there once again. The club are also delighted once again with the support from the business community. Alongside the fans, more than 600 corporate guests will be welcomed to the hospitality tents, many of which are returning from last year’s match against Gloucestershire. “Without the corporate support, it would change the landscape entirely. Advanced ticket sales have also been encouraging. “Last year we reached 4,000 and this year, we are on track for 5,000, which is the maximum. That would be a tremendous achievement. It’s another plus for Eastbourne and part of the regeneration on the town. “It’s about enjoying cricket and hopefully creating memories for the youngsters who can get their first taste of professional cricket.